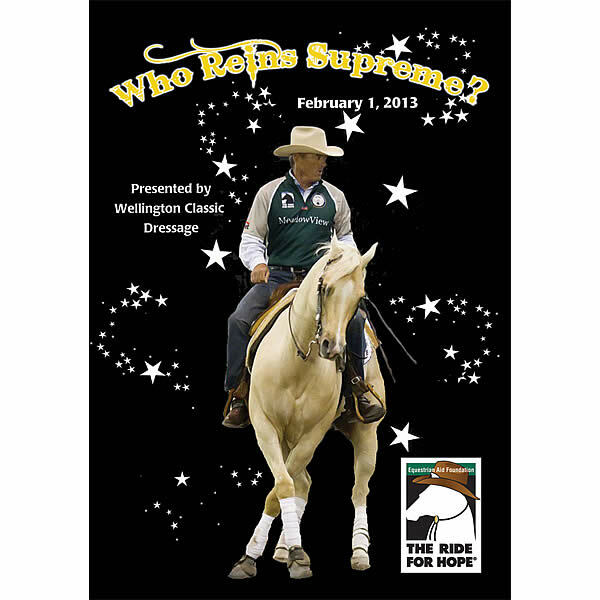 Wellington, FL – January 29, 2013 – Wellington Classic Dressage is proud to be the presenting sponsor of “Who Reins Supreme?,” a February 1 charity event at Palm Beach County Jim Brandon Equestrian Center benefiting the Equestrian Aid Foundation. “Who Reins Supreme?” fields teams of world-class equestrians from dressage, show jumping, hunter and polo, who will tackle a custom reining test of speedy spins and sliding stops. The teams win bragging rights as to “Who Reins Supreme?” across multiple equestrian disciplines. The 6 p.m. event also features special guest Tom McCutcheon, World Equestrian Games’ reining double gold medalist, as well as a Taste of Charity showcase, auction items and live music. There will also be a presentation of the Equestrian Aid Foundation Luminary Award honoring R. Bruce Duchossois. The evening begins with cocktails at 6 p.m., followed by the competition and Taste of Charity at 7:30 p.m., with music starting at 9 p.m.
Wellington Classic Dressage (WCD) is contributing the expensive infrastructure already in place at Jim Brandon for the World Dressage Masters CDI5* Palm Beach for the event. WCD Managing Partner, John Flanagan, is a staunch supporter of the Equestrian Aid Foundation and said he is glad to help. “We are a community organization and we want to support the community,” he said. The Equestrian Aid Foundation is a national non-profit that provides financial assistance for those in the horse community suffering from catastrophic illness or injury throughout their time of need. EAF grant recipients receive funding for medical, healthcare, rehabilitation and essential expenses, such as food and housing. Other sponsors include Sidelines Magazine and Tito’s Handmade Vodka, sponsor of the Taste of Charity. For tickets, go to equestrianaidfoundation.org. Like them on Facebook at https://www.facebook.com/EAF.Ride4Hope. Follow them on Twitter at: Twitter.com/ride4hope.